Last November, my mother flew over to stay with us for Thanksgiving week. On the eve of the big holiday, that Wednesday afternoon at the tail end of November of which it often appears that the only people left working in America are those transporting all the other people, I took advantage of unusually heavy early-season snow to sneak in a few runs on Hunter Mountain. …Yes, we go back down again. And again. And again. And so on, until we finally give in to exhaustion or the mountain closes for the day. All recreational sports – especially those that don’t reach a ‘result’ – can seem pointless if you examine them closely enough, but skiing seems especially so. How can so many people get such a thrill out of doing the same thing over and over again? But therein lies its appeal. Skiing (and snowboarding), as any aficianado will quickly assure you, is a sport that never produces the same results twice. Each mountain varies in its topography, its vertical drop, its climate, its conditions. And each run on every mountain offers equal variety. There are the cruisers and the moguls, the straight ‘corduroy’ and the spring ‘corn,’ there are groomed pistes, off-piste trails and occasionally there’s backcountry to explore. 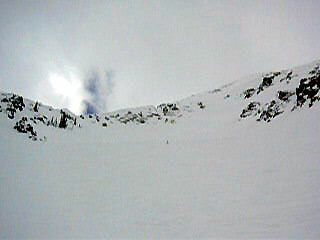 There are bunny slopes for beginners, wide intermediate trails that wind casually around and across a mountain, and there are the steep drops marked by their single or double black diamonds or worse: warning signs which only need a skull and crossbones to prove that death awaits any skier who has not already successfully conquered the run in a previous life. Most importantly, for those of us who pursue the sport (and here lies the crux of our addiction), no repeat journey down one run is ever quite the same as the one that preceded it. You will always find yourself coming down at a different pace, at a new angle, or an adjusted posture. In turn, the run will greet you with an altered course. It might be softer than it was twenty minutes earlier, it may have had moguls carved out of what was previously just flat snow; it may have exposed some natural terrain of rocks and undergrowth; it may present you with bumps or crevices you avoided or failed to notice last time round; or the sun may have dipped behind clouds or over the peak and the run will have a fresh coating of ice. They say that the mark of insanity is repeating the same process over and over again and expecting a different result. 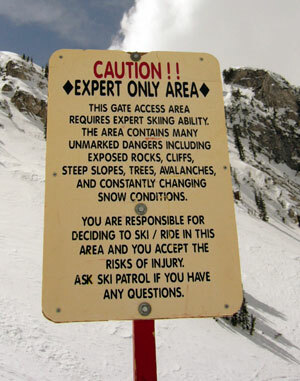 By such criteria, then, it’s confirmed: downhill skiers, snowboarders and the like are crazy. 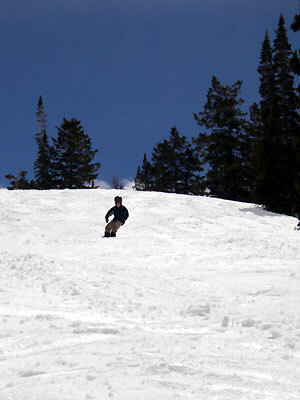 The skier or snowboarder, then, is an animal always aware of changing elements, fresh challenges, and new thrills. Above everything, though, he or she is perpetually chasing a certain sensation – that feeling of complete mental purity, of being totally at one with the mountain and completely absorbed with the moment. Everyone longs to escape the pressures of work, mortgage, and other professional and personal responsibilities. But coming down the mountain, such escape is not merely a choice: it’s a necessity. In some States, getting this high is a felony. Snow had been falling throughout Monday night and as our fully packed tram neared the peak, the entire Wasatch range disappeared into a white mist. The tram conductor issued what would become a familiar refrain about the “easiest route down,” accompanied by the repeat of a warning we had seen at the tram entrance: the peak was for “experts only” this morning. (In other words, there was no easy route down.) We stepped out onto the peak, precisely 11,000 feet above sea level, and as snow fell hard on our clothes and equipment, struggled for a sense of direction. The map was all but useless right now, and so were the markers, which were all invisible until you’d already passed them. Snowbird regulars fanned out from us in every direction, both back down the mountain face our tram had just climbed, and over the edge into the vast expanse of Mineral Basin beyond. By the time Campbell had affixed his snowboard, the only other skiers still at the peak were similarly disoriented novices. Following each other along the ridge for fifty yards or so, we quickly realized that we’d already missed the entrance to the sole blue – or intermediate – run down the mountain. Our only choice was to enter the vast bowl of the Gad Valley in front of us, all of which was designated black or double black, though all of which looked white as far as the eye could see. And, it should be noted, the eye could not see far at all. The view back up into the Gad Valley, taken on our second day. The first day we couldn’t see anything but white. Thirty seconds later, as I carved my way through a fresh bowl of snow bigger than the whole of Hunter Mountain, I heard a reassuring sound behind me: “Whoo-hooo! The snow is fantastic!” And there was Campbell, slicing and bouncing his way through the six inches (and several acres) of fresh powder like he was having the greatest time of his life. There are all the psychological, practical and physical explanations for an adult’s addiction to the downhill. And then there’s the child’s reasoning, which is the most valid of all: THIS IS FUN! The reason we do it? THIS IS FUN!